Originally found in Sicily by a Franciscan monk in the late 1600s they were brought to England and over the next 200 years became the emblem of Edwardian England. Carried to America by early immigrants, Sweet peas are still found in every fragrant garden. 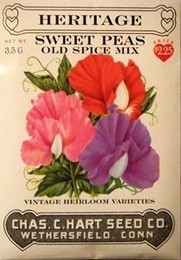 Most fragrant sweet peas have a honey - like perfume, Old Spice has an added undertone of clove which made it a favorite in the garden and the parlor. 5 foot tall study vines produce a profusion of 1 inch butterfly-like blooms from late spring until early summer. To hasten germination, soak seeds for 24 hours in room temperature water. Plant seeds indoors 6 weeks before last spring frost or plant directly outdoors in late spring. Cover seed with 1/4 inch of fine soil. Sweet peas grow best in full sun but will tolerate light shade. They require alkaline conditions, add lime if needed. Removing spent flowers will prolong bloom time.